Hiring flattened in August as the debt-ceiling gridlock gripped Capitol Hill and an Eastern Seaboard hurricane generated the first month of flat employment in 66 years. Fears of slow growth have now given way to suspicions of stagnation, compounded by the Fed’s incapacity to take substantive action and Congress’ inability to pass any resolute stimulus to bolster the economy. While risks of a “double-dip” remain significant, the economy will likely limp into the holiday season with high unemployment and a reticent corporate America awaiting clearer policy positions in Washington. That message could be delivered with the White House’s job plan on Thursday, but the highly fractious political stalemate may continue, limiting any government-spawned traction through the end of the year. 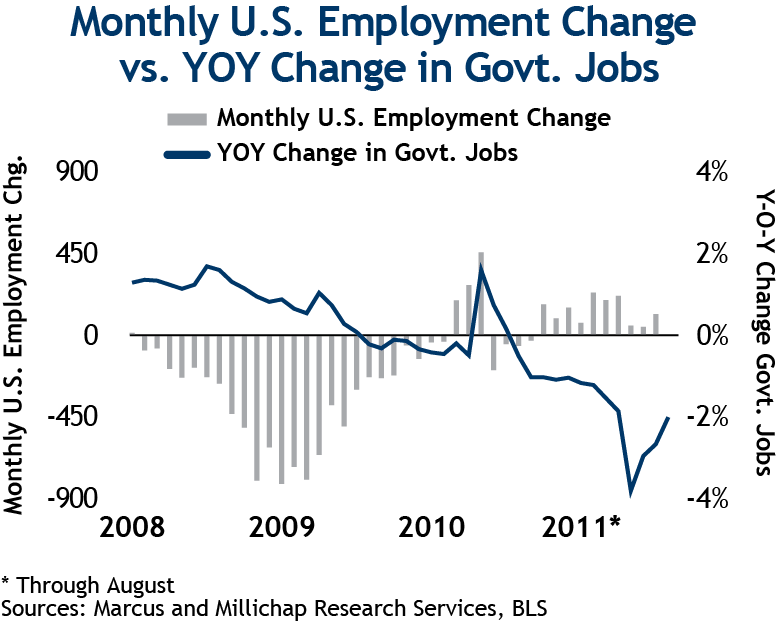 The government sector shed just 17,000 jobs in August, the 14th decline in the past 15 months. The sharp drop in public-sector job losses is a welcome sign that government payrolls could be stabilizing, easing their drag on private-sector momentum. During the recession, 8.7 million private-sector jobs were cut while governments continued to modestly expand headcounts. 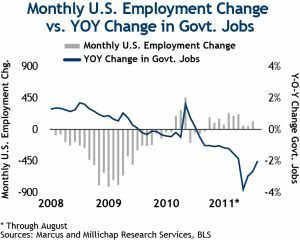 The inability of government agencies to transition to weakening economic conditions helped ease the depth of the recession, but the 1 million public-sector jobs lost over the last five quarters have dampened a recovery. The brightest spot in the August figures was the addition of 34,000 education and health services jobs. Medical office space has outperformed through the recession and vacancy stands to fall to 11.4 percent by year-end 2011, a 40-basis-point improvement from last year. Spending cuts could adversely impact this segment in the coming months, however, as many of these positions are heavily reliant on the government’s Medicare and Medicaid spending. The professional and business services sector added 28,000 jobs for the second consecutive month in August, offsetting modest cuts and gains in most other private-employment sectors. Since the beginning of the year, this segment has added 35 percent of the new jobs in the country, fueling net absorption of over 8 million square feet of office space. Until these high-paying positions translate into ancillary positions, however, the unemployment rate will remain near 9 percent. Even employed workers are rethinking transitions into homeownership as stagnant payrolls continue to raise concern. Pending home sales fell more than 1.3 percent in the most recent period, and single-family homes are falling out of escrow more frequently as uncertainty surrounding the economy looms. As a result, would-be homeowners are remaining in apartments for longer periods, helping drive down vacancy this year 100 basis points to 5.6 percent. This entry was written by marcusmillichap, posted on September 2, 2011 at 11:31 pm, filed under Research and tagged Employment, research. Bookmark the permalink. Follow any comments here with the RSS feed for this post. Trackbacks are closed, but you can post a comment.